I've been knitting up a storm recently, but it hasn't been a particularly happy experience. A dear friend is dealing with her father's just-diagnosed late-stage metastatic cancer. We've been lucky enough to get to know her dad, Himself even more so then me, and the news about his cancer has been very difficult. 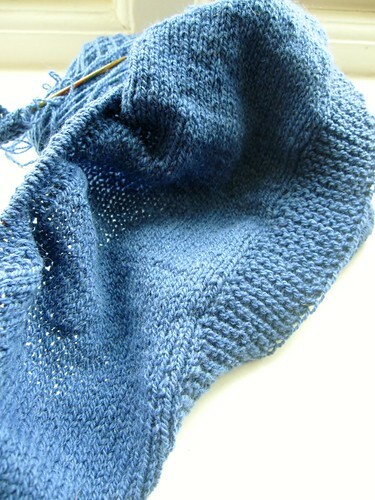 I don't set much store in prayer, but my immediate reaction to the news was “I must knit him something”. After consultation with the daughter, I decided to knit him a nice, warm jumper to ward off the post-chemo chills. 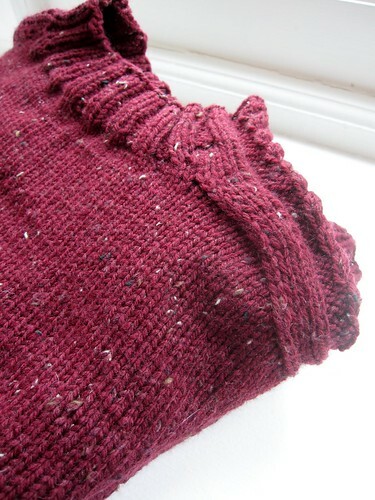 I did a bottom-up, saddle sleeve sweater all in one piece, á la Elizabeth Zimmerman – a technique I've wanted to try for a while. I did a simple 2x2 cable up each side and along the outside of the sleeve up to the collar. The yarn is Colorado Yarns Durango, a wool/acrylic/viscose blend I've had in stash for a looong time. The finished sweater is cozy and warm, easy to care for, and hopefully will help keep him comfortable and warm in the coming months. After finishing that off, I knew I wanted to knit something for Mum as well. This is Cinnamon Grace, and since that picture was taken, I've knit the border and started the cast off. Once I've got it blocked, I'll take some better pictures and give some details. They have a hard road ahead, and I knit every stitch of these pieces with good thoughts and hope for them in what is statistically a pretty hopeless situation. I hope they'll wear these and feel us close to them, sending mojo and strength across the miles. Written by porpoise On April 8, 2013 In "FO", "scarves", "sweaters"